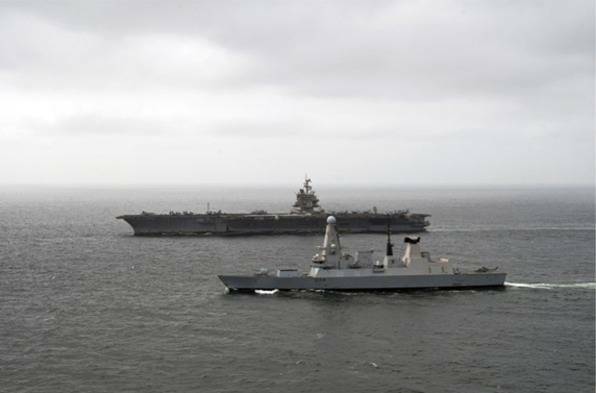 'HMS Diamond' joins with 'USS Enterprise' to demonstrate the Type 45 destroyer's outstanding air defence capabilities. During the exercise warfare specialists in Diamond's operations room helped to choreograph sorties of F-18 Super Hornets and other aircraft, which add to the Carrier Strike Group's potency. As her sister ship Daring did just a few months ago, Diamond joined forces with the 'Big E' to show how a Type 45 destroyer can shield a task group from air attack - exactly what she was built for. The £1bn Royal Navy warship can track multiple targets courtesy of her Sampson radar and take them out, if necessary, at ranges of up to 70 miles (113km) away courtesy of the Sea Viper missiles in the silo on her forecastle. And she can also direct strike missions by guiding aircraft onto targets as well as generally co-ordinating friendly air activity. The exercises also allowed for an exchange of US and UK sailors, known in international naval circles as cross-pollination, sharing knowledge and experience among the ships. "Working with the Enterprise Carrier Strike Group has been a fantastic opportunity to build on Royal and US Navy understanding. The knowledge gleaned will help the Royal Navy maximise the exciting opportunities offered by the Type 45 destroyers."